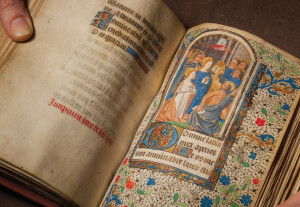 The Spring 2015 issue of Portland State Magazine offers a cover story focusing on Texts of Time, the student-curated Library exhibit on a newly-acquired Medieval Book of Hours. We’ve heard questions from many readers, however, about the cover photograph, which shows a pair of bare hands holding the fifteenth-century manuscript. Some readers have wondered about proper handling of fragile materials and asked if it would be better to wear gloves. Indeed, as conservators write in International Preservation News, the recommendation to use gloves is a dangerous and “pervasive myth” that may result in the tearing of pages. And gloves often carry far more dirt than clean hands. Please see “Misperceptions about White Gloves” in International Preservations News for more information. We are pleased to learn of the Portland State community’s interest in rare book preservation! We welcome you to view the Book of Hours on display in the Library through mid-July.